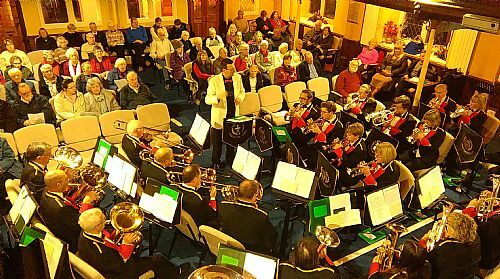 Cowes Concert Band is a brass band which performs regularly throughout the Isle of Wight. Its busy concert schedule includes performances at many churches and during the summer it plays regularly on the bandstand at Rylstone Gardens, Shanklin. The band rehearses on Monday evenings between 8pm and 9.30pm at the Parish Rooms attached to St Mary's Church, Cowes. The band in its present brass band guise was formed in 1951. 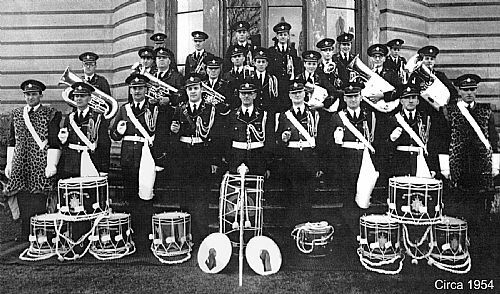 However it is understood that East and West Cowes Town Band - a military-style wind band -was formed towards the end of the 19th century. By the early 1930s the band was flourishing and had close links with the town’s huge J S White’s shipyard, regularly performing at launching ceremonies. The band was also a popular sight at Island carnivals, often leading processions, and became known for its high standard of marching. The Second World War put an inevitable strain on membership and the band was put in abeyance. However, thanks to the enthusiasm of Mr Lewis (Sid) Bircham it was resurrected in 1951 as a brass band when he moved to the Island to work at Saunders Roe plane makers at East Cowes. It made its first public appearance during Cowes Week 1952, followed three weeks later by its first marching engagement at East Cowes Carnival. The following year a full corps of drums was enrolled under Drum Major Joe Hunt. This lead to engagements at most Island carnivals and on three occasions the band played at The Dell football ground in Southampton, providing entertainment before matches and at half-time. Saunders Roe presented the band with a drum major's mace to commemorate the Coronation of Queen Elizabeth II. And the renowned composer Albert Ketelby, who lived in Cowes and had heard the band perform, contributed £5 to the cost of new drums. Lewis Bircham, who also held the post of Bandmaster for many years, taught many of the players from scratch and he formed a junior band to feed players into the main band. 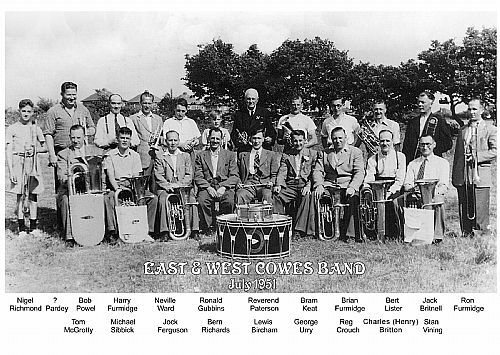 The band continued to thrive in the 1950s and 1960s, performing on bandstands in Cowes and Ventnor and marching in carnivals. Ship launches in Cowes were frequently accompanied by patriotic music provided by the band and in 1971 and 1972 it competed in the Wessex Brass Band Association contests in Bournemouth. A decline in industry in the town in the late 1970s brought with it a shortage of players. The band could no longer support a corps of drums so marching engagements were dropped. In 1975 the name was changed the The Cowes Band and again in 1983 to Cowes Concert Band, reflecting its new role. After several years of struggling with low membership, the band made the bold decision to appoint a professional Music Director. Andy Norman was appointed in 2005 and under his guidance the band has come back up to (almost) full strength. In 2008 the band commissioned new banners featuring the Cowes Town Crest and in 2009 with the help of a grant from HIWCF the band was able to buy new uniforms to finish off their new look. The band continues to grow in numbers and in strength, we lose a few players and we gain a few. Sadly at the end of 2017 we lost Nikki to cancer but her strength and determination was an inspiration to us all. In March 2019 long serving Solo Horn Player, Keith Carden left us to head out West. Keith has been a hard working member of the band, especially good at setting out chairs. He will be missed as now we'll have nowhere to sit. Debbie Wightmore moves from Principal Cornet to Solo Horn and Ryan Wyton steps up to become, probably, the band's youngest Principal Cornet. Cowes Concert Band is very grateful to HIWCF, Cowes Town Council, East Cowes Town Council, Mrs Sonia Price and the audiences of the Isle of Wight who have all helped in the regeneration of the band. Biggest thanks of all go to the playing members of CCB.